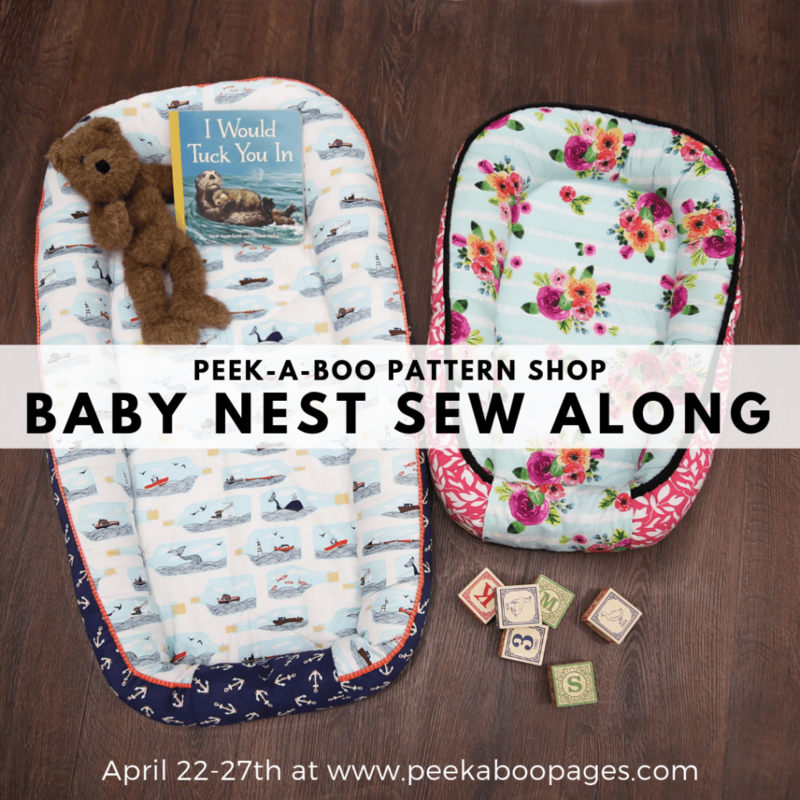 Baby Nest Sew Along - Peek-a-Boo Pages - Patterns, Fabric & More! Learn how to sew a baby nest with our next sew along! The pattern we’re using is the Lullaby Line Baby Nest. The baby nest pattern includes 4 sizes: doll, baby, toddler and preschool. Check the blog everyday 4/22-4/26 to see which portion of the pattern we are sewing. Join the Peek-a-Boo Pattern Shop Facebook group and check the announcements in the group for a daily giveaway (4/22-4/26). Share your finished nest on FB and IG with the tag #pabbabynest. By participating in the sew along and using the tag you are providing us with permission to re-post your photo(s) on the blog, pattern listing and social media. Before we get started, let’s review some very important baby nest safety! All of this information is also included in the pattern along with a free printable safety tag. If you are giving the next as a gift, make sure you include the safety tag and share the information with the recipient. Use your baby nest around the house or bring it with you on all your adventures to the park, beach, friend’s homes, etc. Inspect the nest before use for any loose stuffing, threads, etc. The nest should never be used without supervision. On page 2 of your pattern you’ll find a supply list. For easy reference, I’m posting it here as well. Gather all of your materials now so you are ready for next week! What do I use the nest for? Do I need one for my baby/toddler? The Baby Nest is a clean and comfy place for you to set your baby down while you get some things done! The Nest is easy to carry around the house with you or bring on outings, so your baby has a clean and familiar place to relax while you fold laundry, sew, play with older siblings, etc. For toddlers and preschoolers it’s a great place to read, watch TV or use as a nap mat. It’s also great for pretend play as a boat, spaceship, etc. What size should I make? This is the most commonly asked question about the nest. The finished mattress lengths are listed in the size chart. Keep in mind that most babies and toddlers like to curl up in the nest. If you plan to mostly use the nest while baby is immobile (up to around 4 or 5 months) and then put it away, I would go with the baby size. If you plan to continue using the nest into the toddler years, I would skip straight to the toddler size. You can also cut the nest right in-between 2 sizes for a custom length; just remember you will need to measure how long to make your trim pieces. How long does it take to sew? Is it hard? The baby nest is not a particularly difficult sew. I rate it as an intermediate project and most people can complete it in a few hours (your first one may take you longer). What type of fabric should I use? Can I use knit? 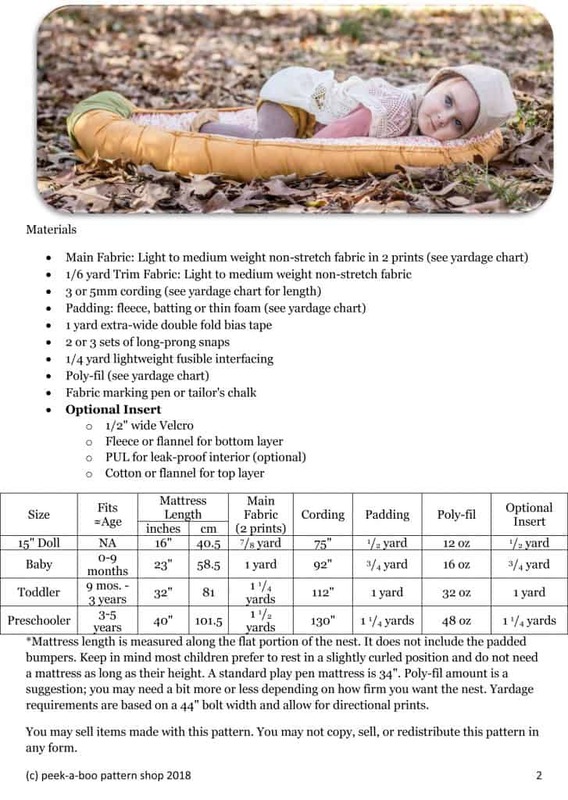 The Baby nest is designed for non-stretch fabrics. Quilting cotton works really well or you could use flannel if you plan to mostly use the nest during colder months. If you want to use knit, I would back your knit in a lightweight fusible interfacing so it holds its shape. You need 2 cuts of fabric for the nest. One piece of fabric becomes the outside of the nest and the other fabric becomes the inside of the nest (this is different than the optional insert). For example, for the baby size you need two 1-yard cuts of fabric. What should I use for filling and padding? The sides of the nest are stuffed with poly-fill. If you prefer, you can also use a natural fiberfill. The padding is for the base of the nest. My preferred padding is 2-3 layers of quilt batting. Keep in mind that babies and toddlers don’t weigh much and very little padding is needed for them to lay comfortably on the floor, especially if you will be using the nest on a carpeted surface or grass. Can I use bias tape instead of trim? Yes! I’ll cover this more next week during the sew along. Buy 2 packs of bias tape so you have enough for the trim and the bias tape used to close up the ends. How much does it cost to make? This will depend on your fabric choice and the supplies you already have on hand, but for a baby size expect to spend around $40. This is assuming fabric is $10/yard and you are not using coupons. What is the insert? Do I need it? The insert lays in the base of the nest (it’s secured with Velcro). The purpose of the insert is to catch any diaper leaks and/or spit up so you only have to wash the insert instead of the whole nest. Alternatively you can just lay a receiving blanket down before placing the baby in the nest. For older children, I personally wouldn’t bother including the insert. How do you wash it? For minor spills, spot clean with a damp rag and air dry. If the entire nest needs to be washed, you can machine wash it on delicate cycle. After removing from the washer, re-shape the nest a bit if the padding has shifted and then lay flat to dry or tumble dry low. Can I use the nest as a pet bed? Yes! The nest makes an excellent pet bed for cats and small dogs. I don’t recommend using the nest for large dog breeds as it doesn’t provide sufficient padding for proper joint health.